. 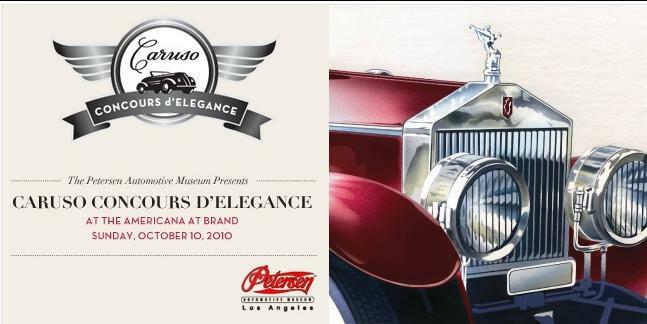 The Prestigious Petersen Automotive Museum in collaboration with Caruso held the third annual Concours d'Elegance. Third Annual Caruso Concours d'Elegance! Presented by the Petersen Automotive Museum. On Sunday, October 10th 2010, The Petersen Automotive Museum once again presented the Caruso Concours d'Elegance at The Americana at Brand in Glendale, California. The Americana at Brand, which is well-known for its high-end retail shops, fine dining and entertainment, and luxury living, is always the perfect choice for it makes quite a stunning backdrop for the gorgeous vehicles displayed on the lawn. The cars displayed, a hand-picked selection of show vehicles, truly represented a fine cross-section of the best of the best. This year's third annual Caruso Concours went back a number of decades to the famous marques of the 1920's and '30s. Prime examples of Bugatti, Rolls-Royce, Delahaye, Packard, Cadillac, Lincoln, Franklin, Dupont and Lagonda were on display, with many of the automobiles stemming directly from the Peteresen Automotive Museum's collection. If you were unable to make it to this incredible showing, you can always visit The Petersen Automotive Museum, that is, unless you want to wait until next year. Also, you can view our entire Caruso Collection of photos by clicking this link. It will put you up close and personal. Enjoy.